On Thursday 1st June, two innocent countrymen were injured and several civilian houses were damaged in the indiscriminate bombing of savage foreign invaders in ‘Farghamir’ area of ‘Jurm’ district in ‘Badakhshan’ province. On Thursday 1st June, ten civilian people were incarcerated during a raid of internal mercenary forces in ‘Zadran’ village of ‘Chahar Dara’ district of ‘Kunduz’ province. 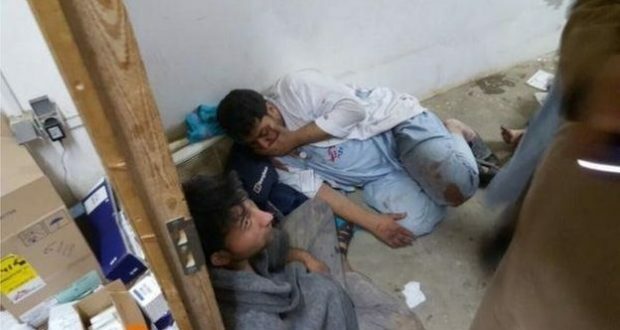 On Saturday 3rd June, two children were martyred, and three women and two more children were injured in the random mortar shelling of internal in-security forces in ‘Ahmad Khail’ area of ‘Jalraze’ district in ‘Maidan Wardak’ province. On Sunday 4th June, a shopkeeper including his child were martyred while seven other shopkeepers were injured in the random mortar shelling of internal amateurish forces in ‘Sabar’ bazaar of ‘Pachir Agam’ district in ‘Nangarhar’ province. On Monday 5th June, five innocent civilians were relentlessly martyred in an attack of internal mercenary forces in ‘Quruqsai’ area of ‘Pashtun Kot’ district in ‘Faryab’ province. On Thursday 8th June, an ordinary countryman was martyred by the unrestrained Arbaki militiamen in ‘Mamli’ area of ‘Khogyani’ district in ‘Nangarhar’ province. On Friday 9th June, a madrassa student was martyred and another one was injured by local in-security forces in ‘Pla’ area of ‘Farah-Raod’ district in ‘Farah’ province. On Saturday 11th June, local people told the media that a nine-year-old girl was first sexually abused and then hanged to death by the local notorious Arbaki militiamen in ‘Dara-Saidan’ area of ‘Gizaab’ district in ‘Daikundi’ province. On Sunday 11th June, three innocent people (father named ‘Zairi Gul’ and two of his sons named ‘Sharafat’ and ‘Zahid’) were relentlessly martyred and a child was injured by the brutal foreign invaders during a raid on a local brick-kiln in ‘Kama’ area of ‘Ghani Khail’ district in ‘Nangarhar’ province. On Monday 12th June, three civilians, a father and two of his young sons aging between 8 and twelve years, were martyred by savage American forces in retaliation of a road-side bomb blast on their armored vehicle in the suburbs of ‘Ghani Khail’ district in ‘Nangarhar’ province. This untoward incident was also confirmed by ‘Ataullah Khogyani’, the official spokesman of the governor of ‘Nangarhar’ province. On Wednesday 14th June, two daughters of a civilian countryman (named ‘Ghulam Hazrat’) were martyred and one of his son was injured in the random fire of local amateurish soldiers in ‘Zarin Khail’ area of ‘Said Abad’ district in ‘Maidan Wardak’ province. On Wednesday 14th June, a civilian was martyred and three children were injured in the random artillery shelling of internal mercenary forces in ‘Kamishk’ area of ‘Qara Bagh’ district in ‘Ghazni’ province. On Thursday 15th June, a 12-year-old boy (named Hamid s/o Naeem) was relentlessly martyred by the local stooge soldiers in ‘Kutab’ village of ‘Jalga’ district in ‘Maidan Wardak’ province. On Friday 16th June, a helpless wheel-barrower, for not giving illegal cash, was beaten to death by the local policemen in ‘Pul-i-Sokhta’ area inside the capital city of ‘Kabul’. On Friday 16th June, an innocent driver was relentlessly martyred on the lame accusation of having contacts with Taliban, and three other civilians were incarcerated by the local notorious Arbaki militiamen in ‘Tazi Rabat’ area of ‘Shajoi’ district in ‘Zabul’ province. On Saturday 17th June, three civilian countrymen were martyred during a raid of internal mercenary Special Forces in ‘Pudina’ area of ‘Khakraze’ district in ‘Kandahar’ province. On Sunday 18th June, a student and six other civilians working in a chicken farm were brutally martyred and five other people were taken away as prisoners during a raid of savage foreign invaders with the collaboration of their internal mercenary forces in ‘Siyah Chobe’ area of ‘Ggani Khail’ district in ‘Nangarhar’ province. On Wednesday 21st June, two innocent civilian drivers were martyred, for not giving the illegally desired amount of money, by the local policemen in ‘Sorao-Shorao’ area near the capital city of ‘Farah’ province. In protest against this untoward incident, the local people blocked the main road of ‘Farah’ province, and demanded the trial of the perpetrators as soon as possible. On Friday 23rd June, two innocent villagers were martyred and three others were incarcerated during a joint raid of brutal foreign invaders and their internal mercenary forces in ‘Sara Baghal’ area of ‘Maiwand’ district in ‘Kandahar’ province. On Thursday 29th June, houses of civilian people in ‘Siyah Chobe’ area of ‘Ghani Khail’ district in ‘Nangarhar’ province were raided by savage foreign invaders in collaboration of their internal mercenary forces, in which, main gates of several houses were blasted by bombs; significant amount of valuables were looted during search operation, and three innocent villagers were relentlessly martyred by them before leaving the area. On Thursday 29th June, two civilian people (named ‘Abdul Zahir’ and ‘Abdul Wahid’ s/o ‘Noor Ahmad’) were martyred by the local amateurish soldiers in ‘Karaize Shaikhan’ area of ‘Pusht-i-Raod’ district in ‘Farah’ province. On Friday 30th June, an innocent civilian was martyred and two others were incarcerated by the local stooge soldiers in ‘Zarghun Shahr’ area of ‘Mohammad Agha’ district in ‘Logar’ province. On Friday 30th June, civilian houses were raided by savage foreign invaders in collaboration of their internal mercenary forces in ‘Kuchi’ area near the center of ‘Kunduz’ province, in which, main gates of several houses were blasted by bombs, and, eventually, ten innocent villagers were taken away as prisoners.